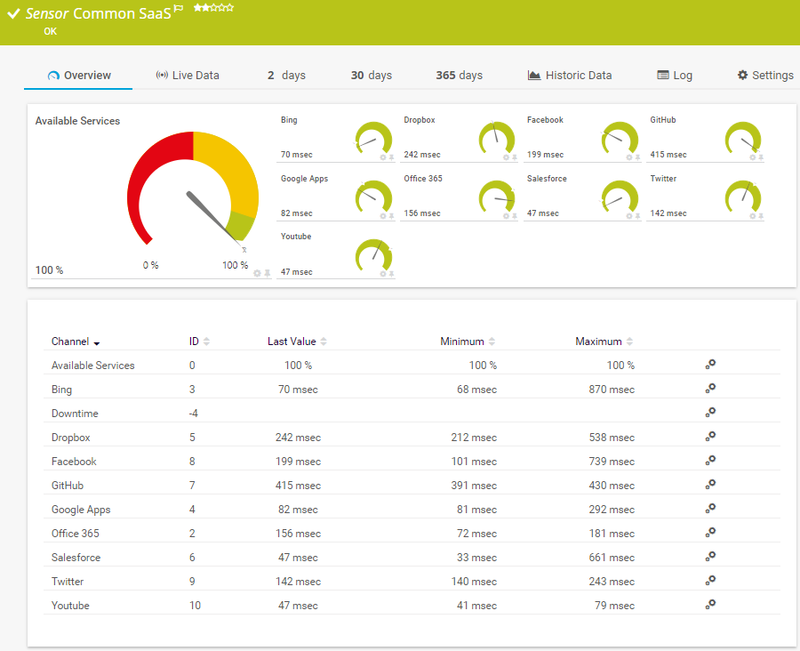 The Common SaaS Sensor monitors the availability of several Software as a Service (SaaS) providers. Because your business processes more and more depend on cloud hosts, this sensor type is an important pillar for unified monitoring. With this sensor you can get alarms if your cloud services are not reachable anymore. The server on which the PRTG probe with this sensor runs must have access to the internet. This sensor type supports proxy server usage. This sensor type has predefined limits for several metrics. You can change these limits individually in the channel settings. For detailed information about channel limits, please refer to the manual section Sensor Channels Settings. Select which SaaS providers you want to monitor. The sensor creates one channel for each service you choose in the Add Sensor dialog. Select the services you want to monitor with this sensor. You see a list with the names of all items which are available to monitor. Select the desired items by adding check marks in front of the respective lines. The sensor creates on channel for each selection. You can also select and deselect all items by using the check box in the table head. Note: This sensor cannot inherit scanning intervals nor use other intervals than given here.